Hard Facts about Sesame seeds Sesame seeds are full of calcium, magnesium, copper, vitamin B1, zinc and dietary fiber. They offer the most nutritional value when the entire seed is used (un-hulled). Whole sesame seeds contain about 88 mg of calcium per tablespoon of seeds. Just a quarter cup of natural sesame seeds provides more calcium than a whole cup of milk. A quarter cup of raw natural sesame seeds has 351 mg of calcium while one cup of non-fat milk has 316.3 mg, and one cup of whole milk has only 291 mg of calcium. Plus, they are alkaline whereas milk is acidic. Sesame seeds are also rich in zinc, another mineral that has a positive effect on bone mineral density. Low dietary intake of zinc is connected with osteoporosis at the hip and spine. Copper, better known for its anti-inflammatory ability shown to reduce some of the pain and swelling of rheumatoid arthritis, is also a supporter of bone and blood vessel health. Health benefits of sesame seeds Delicious, crunchy sesame seeds are widely considered healthful foods. 100 g of seeds provide 573 calories. Although, much of its calorie comes from fats, sesame contains several notable health-benefiting nutrients, minerals, antioxidants and vitamins that are essential for wellness. The seeds are especially rich in mono-unsaturated fatty acid oleic acid, which comprise up to 50% fatty acids in them. Oleic acid helps to lower LDL or “bad cholesterol” and increases HDL or “good cholesterol” in the blood. Research studies suggest that Mediterranean diet which is rich in mono-unsaturated fats help to prevent coronary artery disease and stroke by favoring healthy lipid profile. The seeds are an also very valuable source of dietary proteins with fine quality amino acids that are essential for growth, especially in children. Just 100 g of seeds provide about 18 g of protein (32% of daily-recommended values).\ Sesame seeds contain health benefiting compounds such as sesamol (3, 4-methylene-dioxyphenol), sesaminol, furyl-methanthiol, guajacol (2-methoxyphenol), phenylethanthiol and furaneol, vinylguacol and decadienal. Sesamol and sesaminol are phenolic anti-oxidants. Together, these compounds help stave off harmful free radicals from the human body. Sesame is among the seeds rich in quality vitamins and minerals. They are very good sources of B-complex vitamins such as niacin, folic acid, thiamin (vitamin B1), pyridoxine (vitamin B6), and riboflavin. 100 g of sesame contains 97 µg of folic acid, about 25% of recommended daily intake. Folic acid is essential for DNA synthesis. When given to expectant mothers during the peri-conception period, it may prevent neural tube defects in the baby. 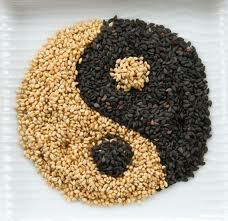 Niacin is another B-complex vitamin found abundantly in sesame. About 4.5 mg or 28% of daily-required levels of niacin is provided by just 100 g of seeds. Niacin helps reduce LDL-cholesterol levels in the blood. In addition, it enhances GABA activity inside the brain, which in turn helps reduce anxiety and neurosis. The seeds are incredibly rich sources of many essential minerals. Calcium, iron, manganese, zinc, magnesium, selenium, and copper are especially concentrated in sesame seeds. Many of these minerals have a vital role in bone mineralization, red blood cell production, enzyme synthesis, hormone production, as well as regulation of cardiac and skeletal muscle activities.Just a hand full of sesame a day provides enough recommended levels of phenolic anti-oxidants, minerals, vitamins and protein.